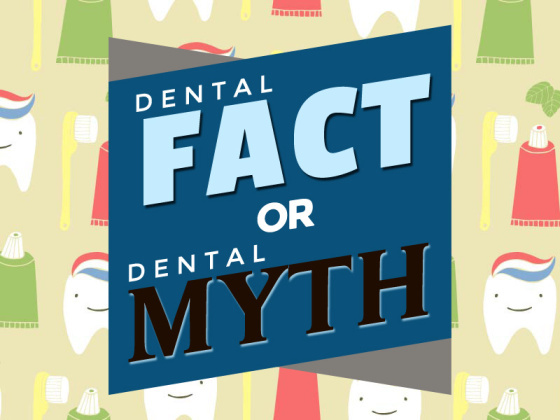 Dental Myths - which are true and which are false? There are a lot of dental myths and slightly odd stories and beliefs related to teeth and dentistry, it can be hard to sort out which may have an element of truth in them, and which are completely false. So here's my guide to the most common dental myths, to help you sort out which ones you can safely ignore, and which ones you might want to pay some attention to! Using dental floss may pull out my filling or my dental cap. My answer; This will only be true if there is already an existing problem with your filling or your dental cap. If the adhesive has failed, or something has developed a small crack, then 2 things will happen; first, microscopic bacteria will get in there and start the process of tooth decay. second, the filling or cap will be less secure, and so you may pull it out while flossing. BUT this is a GOOD THING! It shows you that there was something wrong going on, and that it needs attention. Think of it as being like an early warning system for teeth! Using dental floss will never pull out something if it's all in good order. After I have had a dental local anesthetic (a "shot"), I can't drive a car for a few hours because it will make me sleepy. My answer; Not true. A local anesthetic only has an effect in a small area - your mouth. It will not make your sleepy, nor will it affect your ability to drive a car safely. I can also slip in another myth here - that dental shots always hurt; NOT true! Take a look at my guide on how to get a painless shot! When I was pregnant, the baby took the calcium out of my teeth, causing my cavities. My answer; Not true. The calcium in your teeth is locked in, and cannot be removed by your blood circulation. The ONLY way you can lose calcium out of your teeth is by allowing acid-producing dental plaque bacteria to build up on your teeth. I have to wait 24 hours before I can eat on a new filling or cap. My answer; This had some grain of truth for metal amalgam ("silver") fillings in the past. For modern tooth-colored fillings and all caps, just wait until the local anesthetic wears off. This will help prevent you chewing your cheek/tongue/lip by accident, and allows plenty of time for the modern adhesive to set. So you can eat cautiously as soon as the feeling has returned to normal. But there ARE some adhesives that DO take up to 24 hours to reach their maximum strength - so go gently at first! If I scrub my teeth really hard with a BIG brush, I will get my teeth cleaner than with a little brush. My answer; NOT true, for two reasons; First, a small brush head can get around your teeth more efficiently than a big brush, AND scrubbing hard will not allow the bristles to work well. So the best way to brush your teeth is with a small-headed brush, like the Cybersonic3 sonic toothbrush, and go slowly and gently to allow the brush to work at it's best. Chewing a sugar-free chewing gum will clean my teeth just as well as using a tooth brush. My answer; Not true. It IS true that chewing a sugar-free gum can help to stimulate saliva, which helps to reduce any acids from dental plaque in your mouth, and so will tend to reduce your risk of getting cavities, BUT chewing gum will NOT remove the acid-causing dental plaque. You still need to brush your teeth! Dental cavities are only caused by eating sugary foods like chocolate, candies and drinking sugary sodas. My answer; NOT true! The bacteria in your mouth that produce the acid (which causes cavities) can live on any carbohydrates. This includes seemingly innocent foods like cheese crackers, chips, and even milk. One of the worst things you can do for a baby is to let it fall asleep while sucking a bottle of milk. The lactose in the milk will feed the plaque bacteria and drastically increase the risk of getting cavities in the baby teeth. If I have gum disease, it's only a problem for my teeth and gums. My answer; Not true. If you have gum disease, your general health will suffer too. In fact, you may be almost TWICE as likely to have a heart attack. You are also more likely to develop osteoporosis (weak bones), and gum disease will also make diabetes harder to control, if you have diabetes. You can read more about the possible heart problems here. If I'm not having any problems, I don't need to get a dental check-up. My answer; Again, NOT true. A lot of dental problems start out small, and develop gradually. Frequently, this process is painless at first until it gets to a certain stage. By then, the problem may be quite advanced, needing more complex (and more expensive) treatment to fix. HOWEVER - there is is ONE piece of advice I can give; As long as you get your check-ups done regularly, then most people will be fine with 12-monthly visits to the dentist. You only need to go more frequently (ie. 6-monthly) if you find you are needing treatment of some sort every time you go, for example small cavities are cropping up regularly, or your dentist advises you to see the dental hygienist. I hope this list of common dental myths will be useful for you, and either put your mind at risk on the one hand, or make you more aware of what is REALLY true on the other hand. 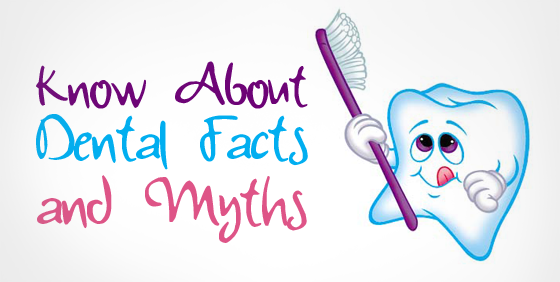 If you come across a dental myth that is not mentioned here, please send me an email at the Contact Me page, and I will add it to this page, with a credit to you!